Ospreys fly-half Dan Biggar says next week's European Champions Cup game against Racing Metro is a must-win encounter for both sides. Biggar, 25, converted centre Josh Matavesi's late try as the Welsh region came from behind to draw 19-19 with the French side at the Liberty Stadium. They face each other again on Saturday with Ospreys now three points behind Pool 5 leaders Racing and Northampton. "It makes next week even more important for both teams to win," said Biggar. The visitors led 16-6 at half-time thanks to Francois van der Merwe's try and the kicking of Johan Goosen. Outside-half Biggar kept Ospreys in touch by kicking four penalties, but when Goosen dropped a goal it seemed to have clinched a Racing win. However, Justin Tipuric's late blistering break let Matavesi go under the posts and Biggar converted. 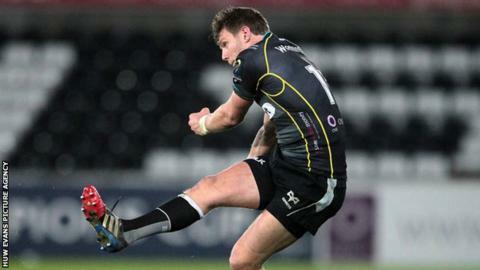 "It's a huge effort to pick up two points," said Biggar. "It's huge credit for us for coming back with such an injury-hit squad against a powerhouse like Racing. "I think overall it was probably a fair result."